Tomato companion plants include basil, nasturtiums, marigolds, onions, chives, and parsley. You'll often see carrots on the list of companion plants for tomatoes, but I wouldn't include carrots because they're light feeders, and the high-nitrogen organic fertilizers that make tomatoes thrive result in excessive top-growth in carrots, at the expense of roots. Basil pairs exquisitely with tomatoes in both the kitchen and the garden. Plant it around the edges of the raised bed or row, and in between plants. Its aromatic foliage helps repel aphids, tomato hornworms, and other tomato pests. Root exudates from basil are said to improve the flavor of tomatoes. 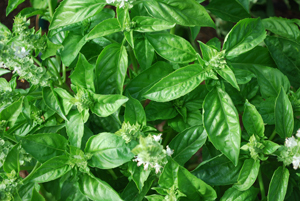 Basil flowers also bring pollinators like honey bees into your tomato patch. See Attracting Beneficial Insects for more information. Nasturtiums, marigolds, onions, parsley, and chives are also valuable companion plants. The aromatic oils repel pests, and root exudates enhance the flavor of tomatoes. Nasturtiums also act as a trap crop for aphids, and can be removed after aphids infest them. In areas where root-knot nematodes are a problem, interplanting marigolds with your tomatoes can help repel them.